July 19 2016, 9:09 p.m. Since then, there had been no published polls from Datafolha — the polling firm used by Brazil’s largest newspaper, Folha de S.Paulo — asking Brazilians if they favor Dilma’s impeachment, if they favor the impeachment of Temer, and/or if they want new elections to choose a new president. The last Datafolha poll prior to the impeachment vote was on April 9, and it found that 60 percent favored Dilma’s impeachment, while 58 percent favored the impeachment of Temer. It also found that 60 percent wanted Temer to resign after Dilma was impeached, and 79 percent favored new elections once they both left. The last poll from the other major firm, Ibope, was published on April 25, and it found that 62 percent wanted both Dilma and Temer to leave office and then new elections held; 25 percent wanted Dilma to remain and complete her term; and only 8 percent favored what has happened thus far: that Dilma is removed and Temer remains as president. Still, that poll — as bad as it was for Temer — was all the way back in April. Incredibly, even though Temer was installed more than three months ago, the Senate is just weeks away from a final vote on Dilma’s impeachment, and the world’s eyes will be on Brazil when the Olympics begin in two weeks, there had been no new polls published — until this weekend. On Saturday, Folha de S.Paulo trumpeted a major new poll from Datafolha that was as surprising as it was positive for interim President Temer. It was also a radical departure from prior polls. The top headline promoted by Folha, which quite predictably went all over the country very quickly, announced that half of the country now wants Michel Temer to remain president through the end of what would have been the end of Dilma’s term in late 2018. Poll graphic: What is best for the country? Highlighted paragraph: In politics, 50 percent advocate that Michel Temer remain as president, and 32 percent prefer the return of Dilma Rousseff. Not only was this result shocking given the widespread animus toward Temer revealed by prior polls, but it also made no sense on its own terms. To begin with, other Datafolha questions that asked who voters preferred to become president in 2018 showed that Temer was at only 5 percent, compared with the poll leader, former President Lula da Silva, who was between 21 and 23 percent, followed by Marina Silva at 18 percent. Moreover, only 14 percent approve of Temer’s new government (compared to 31 percent who strongly disapprove and 41 percent who are neutral). Beyond that, a full one-third of Brazilian voters can’t even name Temer as their current president. And, as one left-wing site noted in denouncing this latest polling headline from Folha as a “statistical fraud,” it is simply inconceivable that the percentage of Brazilians favoring new elections fell from 60 percent in April to 3 percent now, while the percentage wanting Temer to remain as president skyrocketed from 8 percent to 50 percent. All of those facts made it extremely difficult to understand how Folha’s top-line headline — that 50 percent want Temer to remain as president through the completion of Dilma’s term – could possibly be true. It’s contrary to all known data. But Folha is the country’s largest paper; Datafolha is a reasonably credible polling firm; and they were unequivocal in their headline and lead graphic about this result. Despite all these obvious grounds for doubt, Folha did not publish the actual questions asked nor the underlying data with this article, so it was impossible to fact-check their claims. As a result, this headline — that half the country want Temer to remain as president through 2018 — was heralded by most media outlets and instantly became ingrained as fact: as a potentially lethal fact that could easily seal the deal against Dilma. After all, if 50 percent of the country literally want Temer as their president through 2018, it’s hard to see how fence-sitting senators will deny them what they want. But yesterday, the full data and underlying questions were made public. It is now evident that — whether through corrupt motives or utter ineptitude — a journalistic fraud has been committed by Folha. The reason only 3 percent of Brazilians said they want new elections, and only 4 percent said they want neither Dilma nor Temer to remain as president, is because the poll question excluded those as options. As the journalist Alex Cuadros noted today, the actual question that was asked only gave respondents two options: either (1) Dilma returns or (2) Temer stays through 2018. Question 13: In your opinion, what would be better for the country: that Dilma returns to the presidency, or Michel Temer continues in the term until 2018? So clearly, 50 percent of Brazilians did not say that it would be best for the country if Temer continues to complete Dilma’s term in 2018: They only said that would be the best choice if the only alternative was Dilma’s return. Moreover, it is plainly not the case that only 3 percent of Brazilians want new elections, given that they were not asked that. What happened was that 3 percent of the respondents went out of their way to volunteer that option when presented with the binary choice of “Dilma returns” or “Temer stays.” It’s impossible to know from this poll what the actual percentage is of those who want Temer to stay through 2018, or those who favor new elections, or, for that matter, what percentage wants Dilma to return. By falsely limiting the question to only two choices, Folha ensured that the results would be totally distorted. But that’s simply an argument about polling methodology — whether it makes sense to limit the choices to just those two outcomes. What happened here was much worse. Once Folha decided to limit the question this way, they can’t then deceive the country by pretending that the respondents were offered the full range of choices. 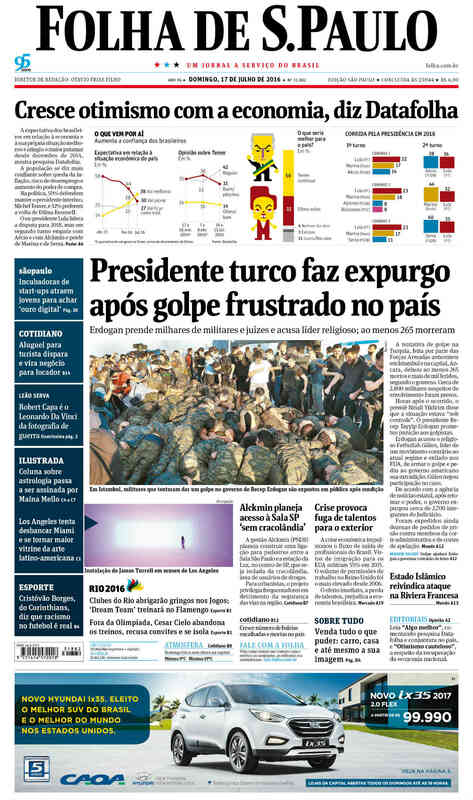 By concealing that fact, Folha’s headline and lead graphic were not just misleading but outright false. It is plainly false to say — as Folha’s graph did — that only 3 percent think “new elections would be best for the country” since the poll did not ask about new elections. Even more damagingly, it is also completely false to say that “50 percent of Brazilians believe it is best for the country if Temer continues” through completion of Dilma’s 2018 term. One can only say that 50 percent want Temer to stay if the only other choice is Dilma returns. This is no small matter. It’s hard to overstate the impact that this hyped poll has had. It’s the only poll from a credible firm that has been published in months. It was timed right before the final Senate vote. And it contained the extraordinary announcement that half of the country is eager for Michel Temer to remain president through 2018: a headline as sensationalistic as it is false. In an interview with The Intercept, Datafolha’s Luciana Chong insisted that it was Folha, not her polling firm, that determined the questions to be asked. She acknowledged that it is misleading to state that 3 percent of Brazilians want new elections “since the respondents were not asked this question.” Chong further stated that any description of this data that claimed that 50 percent of Brazilians want Temer to remain as president would be inaccurate if it did not note that the question confined the options to only two. UPDATE (Thurs. ): New evidence has emerged showing that Folha‘s journalistic fraud was even worse than we knew when this article was published, and Folha has responded to this article in the form of a news article. See here for our report of those subsequent events.